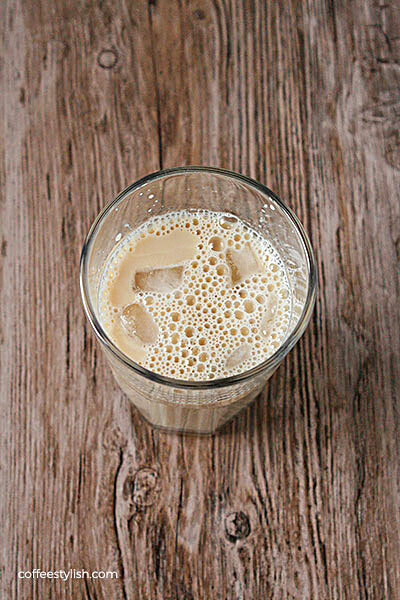 Homemade, freshly brewed, strong iced coffee with absolutely no planning required! 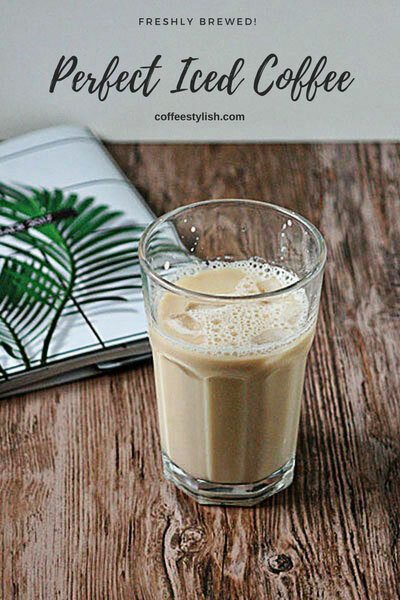 A few years ago, I decided to find a new approach to my iced coffee and find some no nerve-wracking method that makes fresh iced coffee – within a reasonable amount of time. I switched to the Japanese iced coffee method and I haven’t found an acceptable substitution since. This recipe is a total win because it makes fresh, strong cup of iced coffee with absolutely no planning required. The pour-over filter makes this process a lot easier but it’s not a must. I made my own adaptation to this, so you can use any available brewing method: drip coffee maker, french press or moka pot. You can even make this iced coffee with your Keurig (here’s how to do it). It works perfectly every time. What’s brilliant about this technique is that we keep our favorite coffee to water ratio, but we use half of the water for brewing and half as ice cubes. The idea is simple: we make double strong coffee and as the ice melts, it cools the coffee down and dilutes it to its ideal strength. The ratio of coffee grounds to water is a personal preference, just remember to replace half of the water with the same amount of ice cubes. Normally, one large ice cube equals 1 oz water. For regular coffee, I use 2 full tbsp coffee (1 c. scoop) per 8 ounces of water. So for my iced coffee, I use 2 tbsp coffee, 4 ounces of water and 4 large ice cubes. Make double strong coffee using your favorite brewing method. Put 4 large ice cubes into a tall glass. Pour: start pouring coffee really slowly over ice cubes. To finish, add a splash of half and half and sugar to taste. I like to add half and half and a bit of maple syrup to mine – delicious! You’re welcome, I am glad you like it. :) Thanks for stopping by. Wow those look really delicious. Thanks for the recipe, gotta try it out.